G.T. Specialties re-conditions your old Impression or Transfer cylinder pads and fingers, plate clamps, swing arm grippers, stationary jaws, and jaw blades. The average turn-around time is 4 to 6 working days. 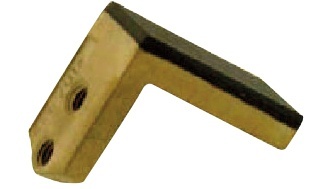 We also have a large stock of grippes for new and old presses. Call or email us for more information. 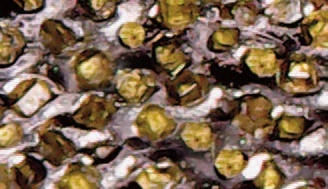 Industrial diamonds are used to create a sandpaper-like gripping texture. 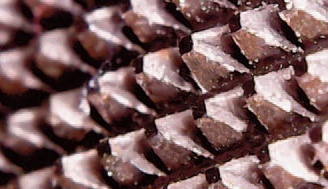 Paper is abrasive and wears down many gripping textures. 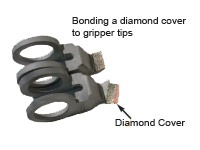 A Diamond-Coated Gripper is hard enough to withstand the wear by paper and outlasts all other metal-sprayed gripping textures. 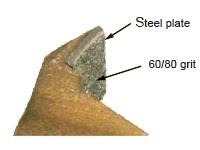 Machined-grooved points, pyramid, and line-grooved points are machine-cleaned. Each pad is made from high-quality carbon alloy tool steel and heat-treated to a hardness of 58/60 Rc. (Rockwell Hardness) for long wear. Urethane coating is cured to a Shore Hardness of 88-90A and tensile strength of 6,000 PSI for peeling off the steel pad or finger. 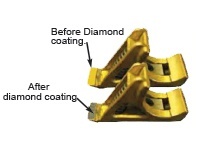 The urethane is machined to meet the tolerance required for each gripper.